After a flurry of large projects – user groups, nested folders, and whole new editor – we’ve spent some time making sure these features worked really well. This included reviewing feedback and making a lot of small changes. Here are some changes that you asked for and we delivered. Collapsible nested folders – When we released nested folders, each folder still showed up under “Pages & Files”. Now you can collapse folders, so you only view the top level folders. Images using the new editor: Images now have the option to add padding. Right click on an image, choose properties to add space around your image and text. User panel – Now when someone requests access to your workspace, you are notified with a help bubble. Subject: I have feedback about Nested Folders. Yea!! This is GREAT! One of the frustrating features was the inability to nest folders! Now I can create folders for different levels/ classes and then nest folders for each project! Thank You! We love feedback! Please continue to let us know what you want to see, and we’ll try our best to make it happen. Earlier this year we surveyed the top 100 educators on PBworks and asked them how we could make their workspace even better. The number one request was USER GROUPS! Specifically people wanted to easily add the same group of users to a page or folder and make it easier to set page security. dianemain: I currently have my students change their display names to include graduation year and to take out full last names (so, for example, Joe Student graduating this year would become “2010 Joe S.”). It would be great if I could put them into groups and then be able to add or remove groups of students to/from a folder instead of having to add/remove them all manually at the start and end of the school year. Well – we listened! 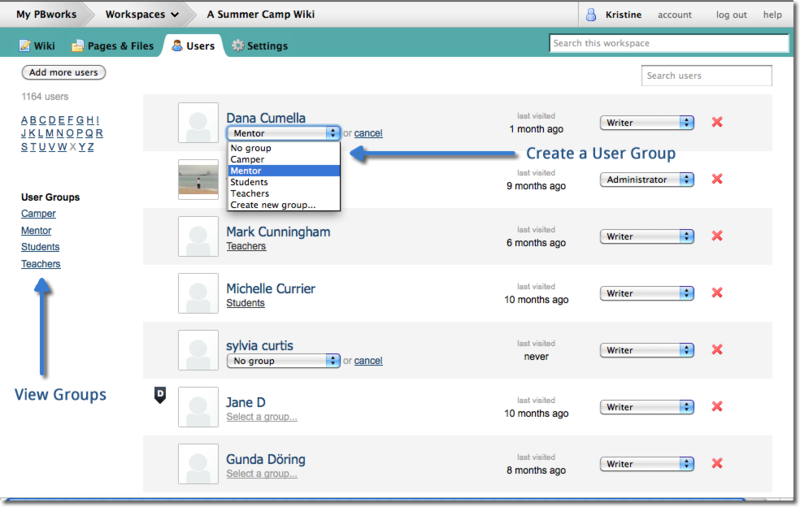 Today we’re pleased to announce that all premium workspaces can create user groups. First, place each user in a group. 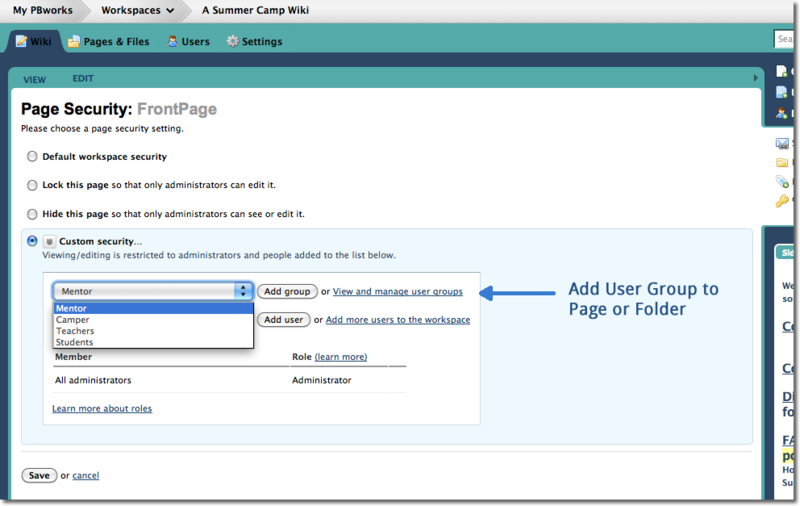 Next, add the user group to set page-level access. This feature rounds out our improvements to the user panel – now all premium workspaces can easily add groups of users to pages, and with the recent security improvements, immediately know what your users can see, and edit.